"Quick & easy! 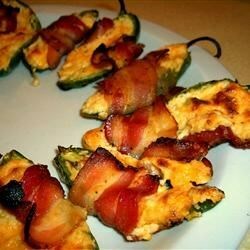 Only 3 ingredients required: bacon, a block of Cheddar cheese and jalapeno peppers. The men in my family are crazy about these yummy treats. In fact, my husband often eats them as a meal!" Cut Cheddar cheese into 12 slices long enough to fit inside the jalapeno halves. Insert cheese slices into the halves. Wrap the jalapeno halves with the bacon slices, securing with a toothpick, if necessary. Place on a medium baking sheet. Broil 5 to 10 minutes, or until the bacon is evenly brown. Try pre-cooking the bacon and adding it chopped to the cheese filling. This was a very good treat. I cooked them in a cupcake pan (3-4 in each section.) This way the cheese didn't melt out and eaveryone enjoyed them! !